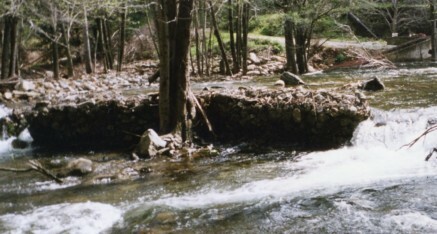 The gabion project at Los Padres Dam was one of the first projects CRSA did with CA Dept. of Fish and Game. 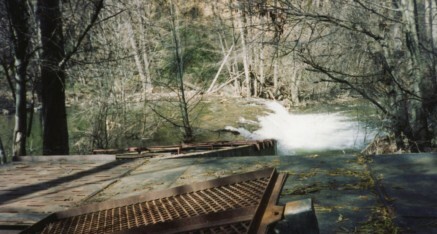 Mas Yokogua, who was president of CRSA at that time, visited the ladder and trap and saw a large number of Steelhead above the ladder and in the plunge pool below the dam. Mas inquired about fish transfers over the dam and found there had not been any recent ones. During that visit, Mas noticed that the entrance to the ladder was above the surface of the river, requiring fish to jump into the ladder. 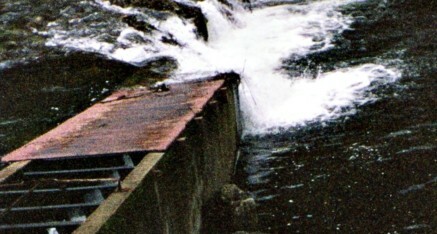 Even if a fish could jump into the ladder it was so full of debris it blocked upstream passage. CRSA offered to help DFG improve the trap by placing a very large rock gabion just upstream of the ladder to try to direct the fish to the ladder entrance. CRSA built, paid for and installed a stainless steel extension to the ladder so the fish did not have to jump into the ladder entrance and a cover over the lower part of the ladder so it would not fill with debris. While it took CRSA several seasons to complete the gabion project it only took one large flood event to wash it away. Even so, the extension and the lower ladder cover made the ladder work much better than it did before.